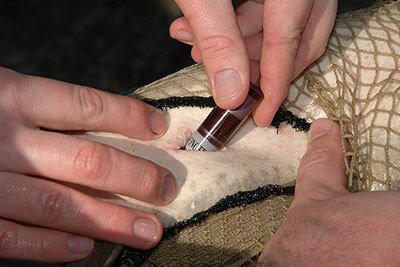 A Thornapple muskellunge being implanted with an ultrasonic transmitter. A graduate student from Central Michigan University tracked 18 muskies in Thornapple Lake in 2004 and 2005. These fish were fitted with sonar transmitters paid for by MMA, and their movements were tracked throughout the year. This study was important in determining the areas where spawning was attempted, as well as seasonal migrations within the lake or into the Thornapple River. Currently Thornapple Lake carries a 50″ size limit due to the low density population that is utilized as broodstock for the MI-DNR muskie-rearing program.